I’m Flattered! Now Stop Stealing My Content! 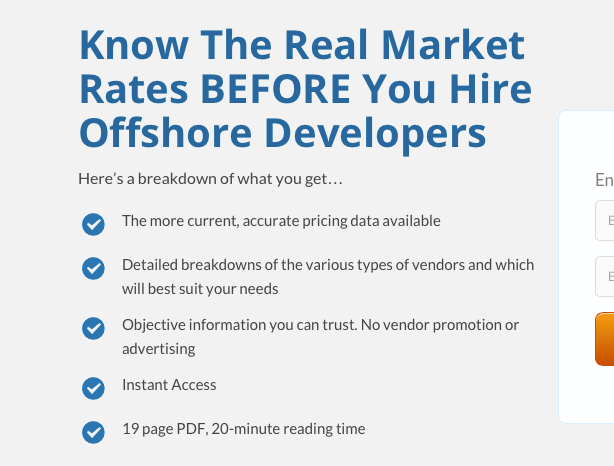 Each year SourceSeek releases our annual Offshore Software Development Pricing Guide, which provides comprehensive pricing information for software developers around the world. The pricing guide is the result a whole bunch of data and a whole bunch of experience interpreting the global market for clients for over 10 years. It’s not easy to gather and organize this data, but SourceSeek is in a unique position to assemble and provide this useful data each year and it’s become one of our trademark pieces of content. So you can probably imagine my shock and disappointment when I opened my inbox this morning and experienced the blatant and unabashed plagiarism that was committed by Capital Numbers, an Indian software company who stole our pricing guide and is promoting it as their own. It appears that they liked our pricing guide so much they decided to use our guide, our landing page, and even the outbound promotional email as if it were their own. Here’s what really makes me mad about this. At SourceSeek we hear from US clients nearly every day who are frustrated with their Indian software teams and are planning to flee to E. Europe. They are frustrated and exacerbated by communication issues, attrition, trust issues, and quality woes and are usually labeling the entire country of India as a bad place to outsource software. Now, anyone who knows me knows that I love India. I lived in Kerala for a while in the 80’s and have returned many times over the last 25 years. As a result, I am quick to come to India’s defense and explain that despite the issues with attrition and shoddy business practices there are still great teams to be found in India. So I really hate to see Indian company do anything that damages India’s reputation as an IT hub. This kind of intellectual property theft is exactly what US clients worry about when they consider outsourcing to India, and that frustrates me because I work hard to protect and improve India’s reputation. Typically when content is stolen the plagiarist will take the time to alter the writing a bit so avoid getting caught. Surprisingly, Capital Numbers went the other direction and kept most of the writing perfectly intact. The promotional email that I received from Mukul Gupta, the CEO of Capital Numbers contained copy that was almost 100% identical to the promotional email written by yours truly. In the guide itself, they stripped out some of the less critical information and added in some self-promotion, but they left most of it word-for-word the same as our pricing guide. Even their landing page copy was nearly verbatim to our own. This was the first time I’ve been the victim of such brazen plagiarism, so I decided to do a bit digging to see what I could learn about the perpetrator. According to our records, Capital Numbers visited our site in April of 2015, submitted themselves to our vendor database, and downloaded our pricing guide. We evaluate every single company that submits their information to our website, and the notes for Capital Numbers simply said ‘body shop’. We use the term body shop to describe a certain variety of software company that we come across a lot. They are usually between 100 and 400 people, with a strong sales force but less skilled management or technical leadership. They tend to be very broad generalists, offering expert talent in just about every technology from SEO to J2EE. A common problem for companies of this type is a very high attrition rate, and this is especially true in India. 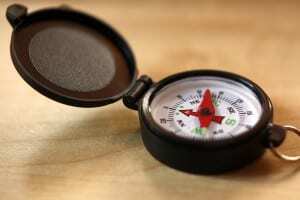 A constant coming and going of employees negatively affect quality and morale. The company soon has no choice but to promote junior team members into leaderships roles which they may not be ready for. We certainly don’t want to expose our precious clients to these risks. THEIR CLAIM ABOUT WHERE THEY GET THEIR DATA IS NONSENSICAL. Capital Numbers seems to have at least 2 alter-egos. I suppose there are legit reasons that could happen, but it certainly gives one pause when a company is operating under several different names, each with similar services. We found Capital Numbers also operating as teams4hire.com, and themes4cms. Capital Numbers displays the impressive client ‘Harvard University’ prominently on their website, but this interview with Mukul reveals that they had done free work for Harvard in exchange for a great testimonial. There is nothing wrong with that, lots of companies do it. It just makes me wonder what I’d learn if I checked up on all of their other testimonials. I found a collection of questionable Google reviews for them, and at least one scathing review at a popular online marketplace. And while it’s certainly possible that Capital Numbers is, in fact, a Google Partner, I was not able to find them under any of their 3 names using the Google Partner search tool. Finally, I saw that the leaders of Capital Numbers seem to have deep ties into one of the most legendary Indian body shops, IndusNet Technologies. IndusNet has some reputation issues of their own to deal with, and any connection between the two companies further supports the idea that this isn’t the kind of vendor we match with our valued clients. Can we confirm, based on these observations, that Capital Numbers isn’t a good company? Of course not. But our experience and methodology lead us to avoid shops with this general profile and that practice has served us well. Even based on this single act of plagiarism I am inclined to question the integrity of the company. How would Capital Numbers possibly be able to collect this data on their own? There’s almost zero chance that they have invested the time and effort to collect ‘real’ data – it’s not easy to do. We’ve been monitoring the market for more than 10 years now and it’s still a huge effort to produce accurate data like ours. Well, this one speaks for itself. Their claim about where they get their data is nonsensical. It would have been easy to just send a DMCA take-down notice and move on. I considered that, but it seemed better to write up this article and publicize the theft of our content. Of course, I hope that Capital Numbers stops using our content, but what I’d prefer would be for someone from Capital Numbers to respond, and even to join me for a recorded Skype discussion about IP protection and how it affects India’s reputation and IT sector. So, here it is. An invitation to Mukul Gupta, whose name appears on the email promoting our content for Capital Numbers. Mukul, join me for a discussion about this. I promise to be civil. We might even have a good discussion about how India can manage its reputation, and how these kinds of things happen in the first place. Perhaps Mukul didn’t even know that the content was stolen, and trusted an employee who claimed to have written it. I’d sure like to know his perspective. If that doesn’t work, maybe I’ll go for a DMCA request! So for the record, I’m flattered that you like our content, now stop stealing our content!